Breathtaking photographs made by Russian roofer. Fearless Russian roofers have been making global headlines for years. Vitaly Raskalov and Vadim Makhorov have conquered Egypt’s pyramids, Rio’s Christ the Redeemer, Moscow State University’s main building, plus skyscrapers in New York, Shanghai, Moscow, St. Petersburg, the list goes on and on. While their risky stunts and breathtaking photos are well-known, there’s a new Russian face in town, her name is Angela Nikolau. Lately her Instagram account went viral. 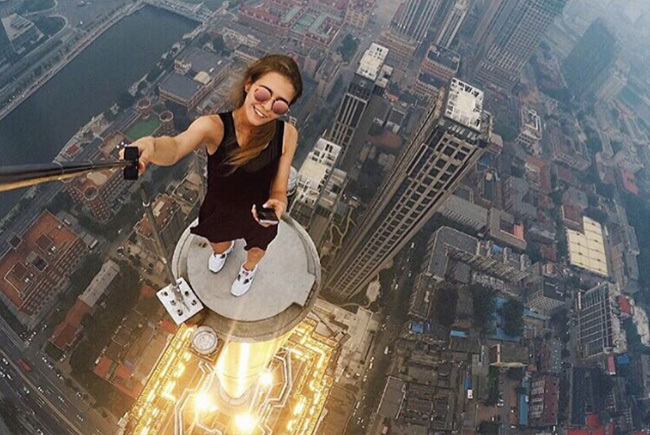 She scales tall buildings, bridges and industrial structures, taking selfies of gymnastic stunts on the edge of skyscrapers with no safety equipment. In Moscow Angela goes roofing with a friend - a three-legged puppy who’s also not afraid to pose on a roof in front of the Kremlin.